Frankfurt’s city center is the ideal starting point for visitors wishing to experience the Main metropolis in a relaxed way. Located within easy reach of the city’s fairs, banking- and shopping districts, as well as the numerous sights: a better connection to the heart of the city is hard to imagine. 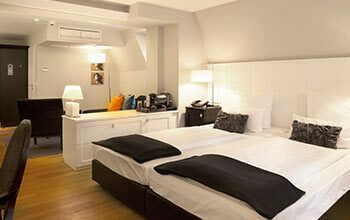 The Victoria Hotel boasts a modern interior, comfort and hospitality. Our team is happy to welcome international guests and are available for you 24 hours a day. A selection of daily newspapers allow you to stay informed and keep you up to date with the latest news. Our hotel bar – which is open 24 hours a day – is the perfect place to relax when you return from a long and eventful excursion or meeting. 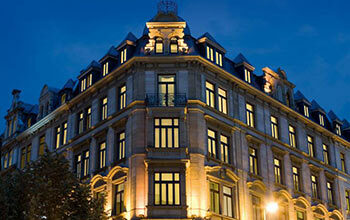 Enjoy your stay in Frankfurt am Main in this protected historical monument – a piece of Frankfurt’s hotel history. We put great value in meeting our guests’ individual needs. A special place in the midst of the bustling city. With its classic design, the lobby is as unique as the historical building itself. Refined stylistic elements playfully intermingle with the modern interior to create a sense of ease and comfort. Due to the hotel’s central location it is easy to reach and perfectly connected to the public transport system. The city center and the fair as well as the central station and the Frankfurt airport (FRA) are just as conveniently accessible as the various excursion destinations in and around Frankfurt. The Victoria Hotel has a total of 73 modern and comfortable rooms, which are designed classy and equipped with everything that is needed for a pleasant stay. 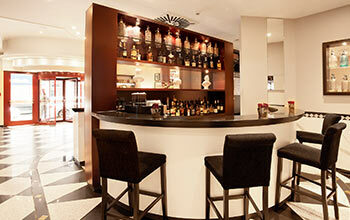 Our hotel bar – which is open 24 hours a day – is the perfect place to end an eventful day.